What is the risk from a nuclear power plant melt-down? If you reach for the well known formula of Risk being the product of Likelihood and Consequence…then you are missing something big. That formula is going to give you some idea of hazard, as in the potential harm that can be estimated by science. Risk needs to capture so much more. You need to work out the hazard, then add the outrage. Outrage is the overall negative human response to an event. How angry are people? How afraid? How upset? How emotionally charged? How suddenly and unusually ready to blockade, write letters, make signs etc? 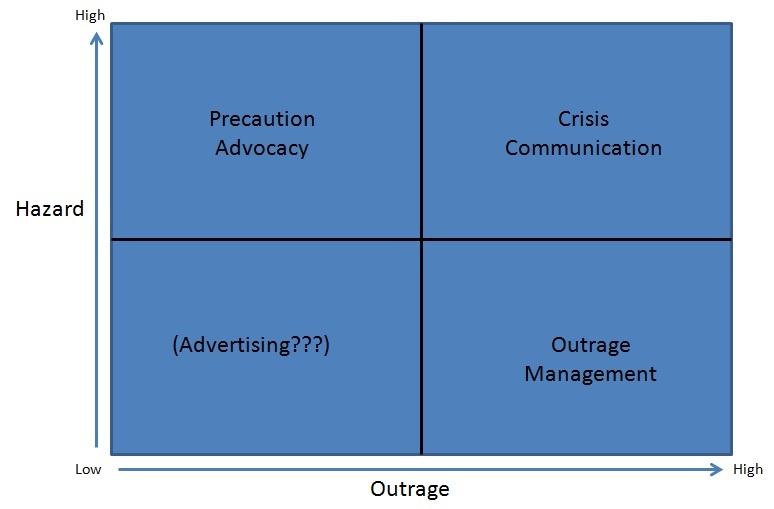 How prepared to change behaviour, take precautions (make no mistake, outrage has its place)? The hazard is on the other side of the world. This is pure outrage. The typical relationship between hazard and outrage ranges from a very small direct one, to a completely inverse one. Throwing out the jargon: the things that hurt us, and the things that make us take to the street, are rarely, if ever, related and often completely different. Having trouble believing it? Air-pollution: Between the outdoor variety driven by fossil fuels, and the indoor variety driven by burning biomass, this is responsible for over 3 million deaths every year. Outrage? Sorry, no. Too-hard basket it seems. These two different qualities for understanding risk have enabled professionals to develop different tools for communication depending on what is required. Where hazard is high and outrage is low, precaution advocacy is deployed. The message is “This is dangerous. We mean it. Pay attention. Take care. Change your behaviour”. It tries to build outrage where it is lacking. A great example of successful precaution advocacy was the effort in Australia to contain the spread of HIV/AIDS . It is used also for smoking and motor vehicle accidents. Where the hazard and outrage are both high then something is serious, people know it and they are paying attention. That requires crisis communication. Clear information and direction are required. Examples requiring crisis communication include an unfolding bushfire crisis in Australia or, indeed, the early stages of the Fukushima nuclear incident. The situation was serious, the potential for harm was not yet well understood but real, and things were changing fast. Where outrage is high and hazard is low, the responsible thing to do is called outrage management. When outraged, people can make potentially harmful decisions, like abandoning their homes, treating their fellow citizens abominably, or spending lots of money for no good reason. Good management of this is crucial. Each situation is distinct. Each has its own professional communication tool kit designed to help people be safe and make sound, informed decisions. Today, we have a situation. The expert evidence keeps lining up that the radiation levels resulting from the Fukushima Daichi meltdowns is a next-to zero hazard in most places. But people are terrified. Homes and communities remain abandoned. People reportedly have treated their fellow citizens as dirty. Greenhouse emissions are rising where nuclear has been rejected. The period for crisis communication is over. People could barely get more aware or concerned, so precaution advocacy is not required. The right thing to do now is outrage management. An abandoned Japanese town. This is helping no one. Unfortunately, from the anti-nuclear movement we keep seeing the opposite. We see efforts that only serve to keep outrage sky-high. To do this they mis-use the skills of crisis communication and precaution advocacy when neither is required. They fudge the hazard with weasel words and misleading statements. They ignore what happened, tell scary stories about what could have happened and ask us to think the same way. They tell people that they are likely to get sick and die before their time and suggest that they need fear their food supply. They highlight the mistakes, errors and poor decisions made by those in charge, building fear, distrust and unease. They attack actual nuclear experts as corrupt because they work in the industry, instead asking us to listen to people with dubious, if any, knowledge of the matters at hand. They do a great many things that can hold back those most affected by the crisis from moving on with their lives. UPDATE: In response to this post, Friends of the Earth promptly removed from their Brisbane branch website reference to deeply flawed research suggesting a link between the Fukushima accident and a “spike” in deaths in the United States. I acknowledge and thank Jim Green for making this happen, and acknowledge that he appeared to have already made the request of the Brisbane branch prior to this article being posted. While I am pleased that this has been removed, we all know it can’t be removed from people’s minds who had already read the statement. I am disappointed that FoE have not also seen fit to disclose this mistake on the site and denounce the research as flawed. This would be appropriate. I request that they do so, much in the manner of any media outlet making a correction. I sincerely hope organisations like FoE will take a more responsible approach to such matters in future. This conduct by anti-nuclear activists and some environmental organisations is deeply misguided and, in the case of those who really know what they are doing, it is just plain low. To compound people’s terror for a political end with no scientific backing is reprehensible. This compounded fear, driven by an ignorance of the true hazard, has proven to be a major long-term health impact of Chernobyl, and Fukushima is shaping up the same way. This video gives the views and findings of actual experts. The challenge of risk communication and outrage management is to bring people to a position where they are prepared to take in this type of information. The outrage we have seen post-Fukushima was inevitable based on underlying ignorance and dread of radiation, and the mainstream media’s hunger for sensationalism. It was then compounded by poor showings by TEPCO and the Japanese Government in their crisis communication and revelations of inadequate planning. But make no mistake. The breadth, severity and longevity of the outrage we have seen is no accident. It is, in part, strategy. Building outrage through tried and true techniques is a known, understood and practiced part of activism. It needs to be called out, named and denounced loudly, clearly and often. They are doing harm. It is, in a word, outrageous. Ben – building outrage is abominable behavior. However, it can be immensely profitable. In the year since one nuclear power station was damaged beyond repair, Japan has gradually shut down nearly all of its other generating stations because people have been taught to be irrationally outraged about nuclear energy. End result – Japan’s fossil fuel bill increased by $55 Billion compared to the year before, even with strenuous conservations efforts. Some rich, powerful and media savvy people shared in that $55 Billion windfall of increased sales. Who could possibly think that was an accident and not part of a strategic policy of reinforcing irrational, but immensely profitable, outrage? We know for a fact that at least two major environmental and health non-profit groups in the US have been accepting large donations from the natural gas industry. (Sierra Club and the American Lung Association have both admitted to receiving millions from Chesapeake Energy during the last few years.) I assert there is a lot more of that going on that should be discovered, exposed and understood. That-makes-me-furious. How the hell do they sleep? I guess they rub a bit of the $55bn on the moral sore spot. The target today was the overtly anti-nuclear brigade. But as you have pointed out before, tarnishing nuclear is simply standard business practice if you are the main competitor, and stoking outrage is a low cost, viral way to do it. Which, as most of us have realised, pretty much makes GreenPeace and Friends of the Earth the best thing that ever happened to fossil fuels. Ben – The Sierra Club is a mainstay of the overtly anti-nuclear brigade. As our oldest and largest “environmental” organization, its position on the issue is important. They actively work against the development of new nuclear power stations and for the early closure of existing nuclear stations. The American Lung Association’s paper on energy is not favorable to nuclear energy, despite its obvious stature as a power source that does not produce any air pollution at all. The nuclear section focuses on uranium mining hazards that were overcome decades ago through better ventilation systems and breathing protection for miners. It also trots out the old saw that we do not have an agreed upon solution for nuclear waste. Sorry I did not make those points clear. The taking of natural gas money while being overtly antinuclear should raise some strong questioning about the real reason for their antinuclear position and the reason why they continue to stoke fear about radiation health effects. Why is it that we remember the bad things people say about us more clearly than the good? When one writes a blog post, or a comment, or even performs in a play; why is it that despite all the positive feedback you get, it’s the single negative comment that really gets your blood pumping? I remember reading somewhere that the reason we remember the bad stuff so readily is because, in evolutionary terms, it’s pays to take more notice of the things that may present as a threat to us in some way (or else, the predator would eat you, the enemy would kill you, etc.) and also, to remember the (perceived) threat clearly, just in case the threat was real and you meet it again. Forget real danger, just the simple threat of danger sears the mind where the benign cannot. Given this propensity, it is unlikely that calm rationality is going to get much notice when it’s in competition with outrageous scare stories. I wonder then, how does one manage misplaced outrage when outrage is designed to stick? I think perhaps Rods on a winner here too. Perhaps the best way to manage outrage is not to quell it, but to divert it. Certainly, we must denounce the fear mongers and correct the falsehoods (as Ben rightly suggests), but I think it’s important to note one other strategy employed in this piece (and picked up by Rod) – we must always, simultaneously, point to where the real danger lies. Gas, coal and oil are the real monsters – let’s build some god-damn outrage there. I attended a rally and march in Brisbane yesterday organized by Lock The Gate and chaired by Allan Jones.This was part of the long running campaign to curb Coal Seam Gas and open cut coal mining in Queensland and NSW.There were 5 female speakers, 3 of them were wives of farmers and mothers of young children. One was a mother in the large acreage residential area of Tara in SE QLD. One was a resident of Gladstone in Central QLD where a CSG export facility is being developed with associated large scale dredging of the harbour with consequent serious environmental damage in the Great Barrier Reef region. These women described their experiences living and trying to make a living in close proximity to CSG and open cut coal operations.They were outraged and the audience were outraged and for good reason.There were about 800 people present and of course there are other supporters who could not get to the rally as many of them live hundreds of kilometres away and/or have work commitments.But this is a drop in the bucket. There doesn’t appear to be any sense of outrage in the mainstream political parties.There doesn’t appear to be much outrage in the broader community who are noted for their ignorance and complacency.So,we are banging our heads against a brick wall,just like the nuclear movement.And the two issues are closely related. Meanwhile,in a article on “The Conversation” this morning Ian Lowe,an academic at Griffith University and noted anti nuclear propagandist has used Fukushima to spread his particular brand of poison.Coincidentally,I have never heard him attack the fossil fuel industry.He is an advocate of renewables. Need I say more? I am waiting for the framed certificates of appreciation to be mailed out from the fossil fuel lobby to some of these people like Ian Lowe. That would seem to be required for them to finally get it. I hope some of this outrage at the gas and coal mining can be channelled to help people appreciate that their energy could come from uranium for a tiny fraction of the land impacts. Good on you for being there. Oh yes indeed! Spot on. The challenge is that we have lived with those gross impacts for so long, they are normal in people’s minds. That needs to change, so yes, we need precaution advocacy to build outrage. While I have made much to-do about not substituting the climate change argument for air-pollution to appease certain people, air-pollution works better for this task: You can see it, smell it, and the harm is has relatively short hibernation before appearing. As for lowering outrage on nuclear, there is a lot that needs to be done in the background at all times by the industry to make this remotely possible. They are getting better but Japan seems to be a gross failure in this regard. You can make up ground in a crisis, but it is hard work. The mistake that is normally made is moving to the facts of the hazard before you have dealt with the outrage. It’s useless if you do that, no one wants to listen to you. I have a good example of nuclear doing it really well (prepping the ground for good relationships, low outrage, and a chance for facts and science to win) from a guy who approached me after my presentation to Rotary last week. He lived next to one in the US for it’s full life. I’ll tell the tale in an upcoming post. I think the points made at the end of the video – that more scientists must make themselves heard – is quite important. I recall reading an IAEA document with a survey of public attitudues to nuclear safety and nuclear power. On the issue of the most trusted sources of information, scientists ranked first, NGOs second(!) and regulators third – all well above governments. Multiple scientists all speaking out could help blunt the hysteria from the likes of Caldicott and fellow travellers. Of course the absurd false “balance” in the media doesn’t help but bring enough scientific “firepower” to bear and the impact could be significant. In particular the cranks must be discredited. Yep, and note the comment from Jim Green of Friends of the Earth below. The cranks must be called out from all sides. “even suggesting a link to a “spike” in deaths in the USA.” You’re right, Ben, the ‘research’ about increased deaths in the USA from Fukushima is not credible, i’ve asked FoE Brisbane to remove that comment from the website, FoE Brisbane said they will remove it … and i’ll send them a reminder if it doesn’t happen soon. Jim, I am so very glad to hear it. Well done and thank you. If you notify me when it has been removed, I will note this in a modification to this post. Thanks again. I really like Marion’s summary of what our response to this outrage should be too: “we must always, simultaneously, point to where the real danger lies. Gas, coal and oil are the real monsters – let’s build some god-damn outrage there.” Amen to that. My faith in the rationality of the Internet community in Australia has been restored after reading this article on The Punch. It’s not the article that is of any value rather the comments below it. Not a good PR decision to blame Australia for culpability in the Fukushima crisis. Also I’d just like to point out that by attacking the gas, coal, and oil industries in Australia, particularly the electricity generators in terms of Gas and Coal, you are effectively attacking the Utilities that will (if Nuclear is decriminalised in the ARPANSA Act) be operating and joining in Joint Ventures to build a N-Plant. These electricity generation companies have diverse portfolios of coal, gas, wind, solar, and hydro generators, it isn’t as simple as the Coal industry, the Gas industry, or the Oil industry when it comes to electricity generation. Which is the context of the first major objective in de-carbonising SA. It would be much better to work with these companies in a dialogue than to demonise them and force them into a defensive posture. Nothing will be achieved that way. Even Areva entered the Australian generation market with their Solar CSP technology. Wise words: “Don’t bite the hand that feeds you”, in this case “potentially feeds you”. Step one will always be amending the ARPANSA Act to level the playing field. Lobby your local representative in both the House of Reps and your local state Senator. No matter what party. Even lobby the Greens, because if they say it’s too expensive (never mind what other analysis says) amending shouldn’t matter using their logic. If they say it’ll fail, let it fail by itself in reality rather than assuming it will. Honest open and accountable facts prevail in the end, they always do. Unfortunately rationality comes second to human emotion, but rationality does come around. How long depends on the person(s). That is chock full of wisdom. Thanks Irregular Commentator, your contribution is always welcome. I have heard similar opinions from the US utility industry for a couple of decades. I cannot count the number of times that someone from the Nuclear Energy Institute has counseled me to tone down my criticism of coal and natural gas. (We no longer use much oil for power generation except in Hawaii, Alaska, Puerto Rico and some of our Pacific Island territories). I have also had a number of employees of the NEI cheer me on privately. They tell me that they wish they could honestly compare energy sources so that they could more easily explain to people why the high initial cost of starting up nuclear construction after a 35 year hiatus is worth the effort. My tactic is not to demonize coal, gas, biofuels, wind, solar, and oil, but to forthrightly point out areas where atomic fission is simply superior. I am glad that we have fossil fuels; I appreciate all of the good things that they have enabled. However, the industry that sells those fuels reminds me a bit of a football star who does not know when to fade away and stop clinging to his position, even after a younger, more capable player has arrived and demonstrated his talent. Fission does not produce any emissions. Eighteen months worth of fuel for a plant serving a million homes can be delivered to the power station using a few tractor trailers. There is enough fuel to last for several millennia. We can recycle used fuel. Volume of waste is tiny. After 50 years of nuclear energy production in the US, we could fit all of our used fuel into a single “Super Wal-mart” big box store. The process of producing fission heat is extremely reliable and naturally stable. The least taxing job on my submarine was the reactor operator. He had very little to do and it was not because there was a fancy automated control system. Physics took care of most of the reactor control. Those facts are far more powerful when put into context against the other energy alternatives. I think you’re needlessly confusing the issue. Coal, gas and oil are products not utilities. Attacking a product for the damage it’s application causes is not the same as attacking the companies that use it. This is especially true when the companies have a significantly less damaging alternative already in use. When that is the case I would argue it is imperative we attack the use of the damaging product and demand the use of the safest, viable alternative (or, in the case of NP in Australia, demand companies be allowed to use it). If we don’t, they’ll just continue using what they’ve always used and nothing will ever change. What this all means is that attacking coal, gas and oil is no more attacking the utilities, than it is attacking you and me. We require electricity. The utilities provide electricity. Electricity can be made in a number of ways that do not have to involve the burning of fossil fuels (the utilities are not, as you say, the fuel they use). In light of the alternatives (Nuclear, hydro, syn fuels of various kinds) the benefits of fossil fuels do not even begin to out weight the risks. The examples of France, Switzerland, Iceland, Norway etc. all show that utilities can affordably produce abundant electricity without resorting to fossil fuels; therefore, we should not, need not, accept their use either. Lastly cold logic and rationality are not good motivators, they tend to tell us only ‘what is’ not ‘what should be’. Why would people lobby anyone into amending the ARPANSA Act if they do not first have a desire (i.e. a forceful emotional response) to see fossil fuels replaced? Personally I hope they start up the reactors in our area of Japan as soon as possible rather than burning the vast amounts of coal they need to while the reactors are offline. Perhaps it’s time to take a lead from the TV show ‘Fat Pizza’ and revive the term ‘stooge’ defined as one who allows oneself to be used for another’s profit or advantage. Those who take CSG money are in effect endorsing fracking. To their credit some of the ZCA people are not stooges of the gas industry just their reasoning has large gaps. Yep, they are, to their credit, clear on not supporting gas as the solution either. Watch Helen Caldicott’s face carefully. She gives away that she is lying. We need to get an expert in facial expressions and lie detecting to watch the video. A cop is not an expert. A poker player is not an expert. We need a PhD psychologist or a psychiatrist who has special expertise and who has done research in facial expressions to watch the video and give us a report. The hazard is many things to the public. It may mean immediate health concerns, delayed health concerns of cancer, economic concerns, loss of jobs, loss of home/land, loss of agriculture/fishing, etc. Not many accident in the world can cause as much damage as a nuclear accident. As a nuclear engineer, I would also be outraged by any of these hazards. Without doubt, the consequences of this incident are very significant indeed. For the people involved, this is certainly a terrible occurrence. There may be a definitional disagreement. By hazard, I would refer to what is commonly called “risk”: the magnitude of the harm multiplied by the probability of the occurrence. This is something measurable. The root hazard of Fukushima is radiological. Everything else raised above is a response to the radiological hazard. The health hazard has been carefully measured and the feedback now from UNSCEAR and WHO are very clear; whatever hazard there may be is so small it will never be noticed. That is NOT to diminish the very serious shortcomings in design, process, planning and management in relation to the incident. However the final hazard has now been measured, and it is small. The health concerns are unwarranted. So is the fear of the food, as this Fukushima native is trying to address with his restaurant. 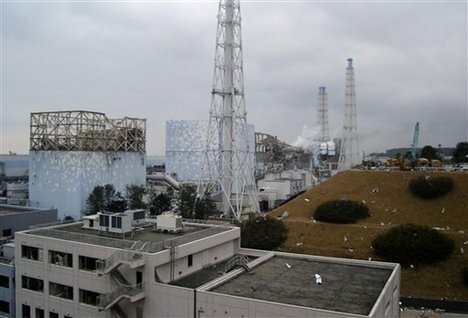 http://www.guardian.co.uk/world/2012/nov/16/fukushima-food-nuclear-disaster, and as measurements attest in the bulk of cases . So is the prolonged closure of so much land leading to the economic and job losses. I would suggest that many, many accidents create as large, or far larger, a hazard. Three that spring to mind include the Bhopal disaster, the BP Deep Horizon Spill, and the explosion at the Venezuelan oil refinery in 2012. The difference to me seems to be the extreme level of fear and scrutiny to hazards that are radiological in nature, which generates a level of response that is, in fact, damaging. There are a lot of reasons why this happens, not all of it the fault of environmental NGOs. This piece focuses on the conduct of environmental NGOs who seek to stoke the outrage. In this they appear to care less about the people of Fukushima, and more about what they can milk from the incident.